I first encountered STAR BLAZERS as a young one circa ‘82 or ‘83. I came across the show accidentally while channel surfing and so ended up starting in the middle of the series. I believe the episode in question was #17: Charge! Balanodon special attack group! (original title). Up until that time, I only had a few episodes of SCIENCE NINJA TEAM GATCHAMAN (a.k.a. BATTLE OF THE PLANETS) and Gerry Anderson’s THUNDERBIRDS under my belt. 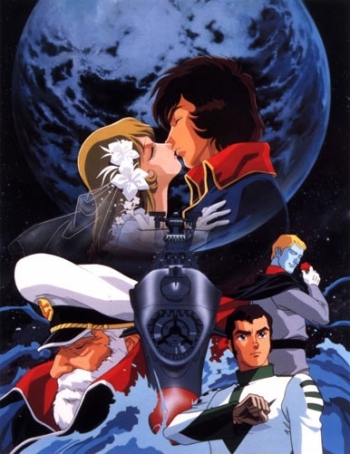 STAR BLAZERS represented the first time that I was able to follow a romantic sci-fi show in its entirety. As I delved into that first episode, I had no idea what was going on other than the fact that the show was Blowing. My. Mind. I had nothing else to compare it to. Leiji Matsumoto’s animation style was stunning, a panorama of infinite beauty to my eyes. Then there were the space battles, the vintage/golden age sfnal adventures, trippy visuals, the military elements, and most of all, a significant focus on the characters and their relationships. Additionally, the show featured very mature themes. War. Death. Conquest. Greed. Love against all odds. I’m sure I didn’t process all of it until much, much later. But I was walking on air for years and years. Inevitably, I became addicted. My local channel even kept running the series back-to-back for I don’t know how long. I am forever nostalgic for those Channel 56 days. Anyway, a major part of my attraction to the series was, of course, the romance between Kodai and Yuki. Kodai is your typical hotheaded Alpha male hero and Yuki is the “ordinary” heroine who tames him. In some ways, their romance is very traditional, especially in terms of gender roles. However, Matsumoto and Co. tweaked the tropes enough that Yuki developed into a totally amazing heroine whose capacity for love left me weeping with joy. Ostensibly, Kodai was the main protagonist/hero, and the series is very much about his coming-of-age story, but with me being a girl and all, Yuki was the character I identified with the most. Did you know…Yuki actually has more than one job aboard the ship? They include ship’s head nurse, radar officer, and some kind of environmental specialist (e.g., scouting planets for food resources). She is a Multitasking Queen! As a youth, I cared nothing about plausibility. I just thought it was freaking awesome that she had so much responsibility. And when she actually was sent on a mission, as in, for example, the episode Planet Beemera, underground prison of condemned criminals!? Like, color me orgasmic. As a result of all that and more, I couldn’t stop thinking about their romance. Looking back, Yamato had enough romance for what it was, yet I was still craved more. More Kodai and Yuki, but also more sci-fi romance couples in general (enter SUPER DIMENSION FORTRESS MACROSS a few years later, but that’s a post for another time). As the series progressed, I hungered for information about it. I began scouting for show related merchandise (not an easy task during pre-Internet fandom) and landed my first major score at the now-defunct Mr. Big Toyland in Waltham, MA. That’s when I learned about the show’s Japanese origins. Which brings me to the issue of STAR BLAZERS being a vastly sanitized and censored version. I was too young and naïve to realize it at the time, but whole chunks of the series had been removed/altered for the supposedly delicate sensibilities of the American audience. Pish on that, I say. While this seems unfortunate on the surface, it actually worked out in an interesting way for me personally. The reason being that when I was able to procure copies of the various Yamato series and films in their original forms (something I did several times over, going from bootlegs to official release video tapes to DVDs), I discovered not only the uncut original material, but also layers upon layers of themes and cultural gemstones I’d been previously unaware of. All of which means that over the years, with each new version I was essentially watching Yamato for the first time. There are countless examples I could describe, but the change that had the strongest emotional impact on me involved what happens to Yuki during the last episode. Needless to say, after such a grand adventure, I felt crushed—CRUSHED—when the show went off the air. This was in the very early days of VCRs and I didn’t have the means—or the budget—to tape the show. I thought, “That’s it. I’m never going to see it again.” Kaput. The End. Lucky for me, I was a raging SF fan by then, and I loved going to conventions. Bit by bit, I started collecting videos, roman albums, and other paraphernalia. Discovered all of the feature films. Then, the Internet happened and I found me some Yamato fandom. Then DVDs came onto the scene. I could now watch SPACE BATTLESHIP YAMATO in all of its incarnations to my heart’s content. Talk about a happy ending…! However, it wasn’t always like that. 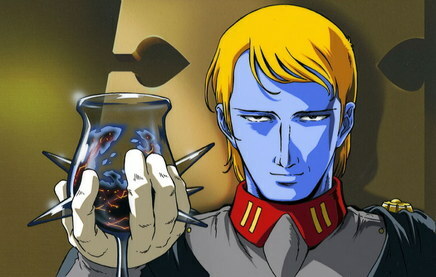 You see, during the years that followed my initial exposure to STAR BLAZERS, I encountered very few people who had seen the show, let alone anyone who wanted to talk with me about it. Seems like you either got STAR BLAZERS or you didn’t. Most of the people around me didn’t. While I’m a much calmer Yamato fan these days, I never forgot what it felt like to be alone in my love for it. That feeling lingered in me for a long time. Still does on occasion. And the Yamato franchise is as popular as ever in Japan. 2010 saw the release of a live action SPACE BATTLESHIP YAMATO, which did very well at the box office there. I very much look forward to seeing it (subbed, naturally). With this post, I’ve now laid the groundwork to share more of my adventures in SPACE BATTLESHIP YAMATO. You can expect them on a periodic basis as we continue our journey. Thank you, my dear passengers, as always, for reading.